Roaming With Celebrities – Run. Ride. Roam. Sometimes we can be in the presence of greatness and not even know it. Today I discovered, that for all these months, I’ve been travelling with a couple of celebrities and hadn’t even realised. I shall now feel honoured. 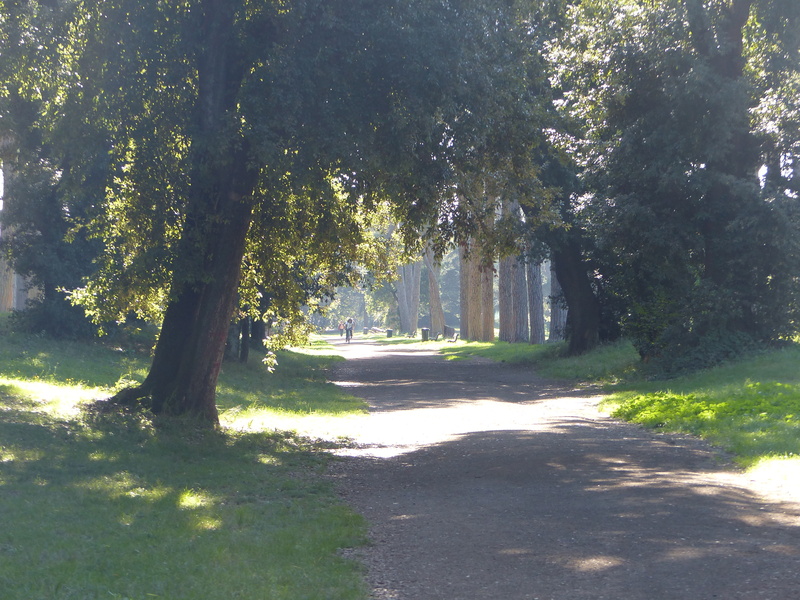 Another glorious sunny morning greeted us in Rome, as we set off for another day of roaming. A self-guided tour was the plan for today, a plan that would see us explore a couple of neighbourhoods on either side of the river. We set off from the apartment and strolled in the sunshine, through a park, which was wonderful. There’s something about parks and greenery and trees, with the sun shining, that just makes the heart sing. It was a lovely place to stroll. 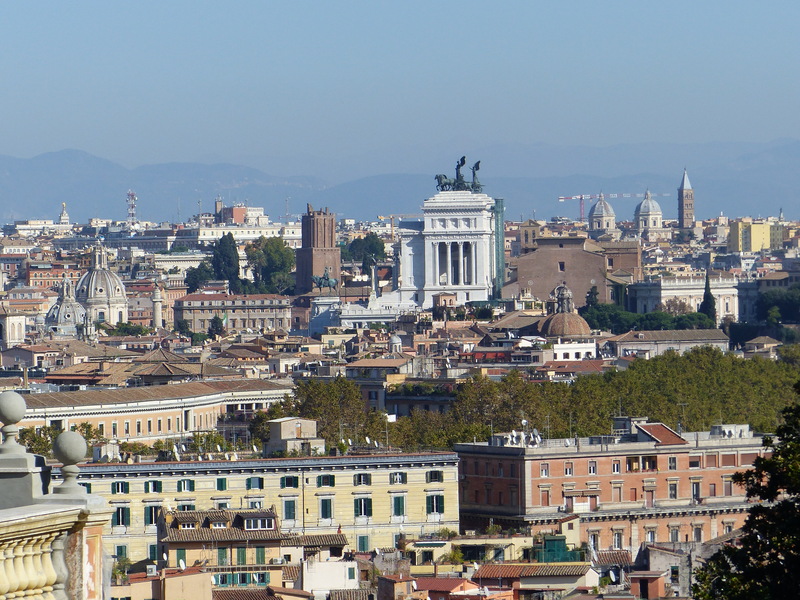 As we left the park and began our walk down into the neighbourhoods of Rome, we had a terrific view across the city. I wonder if there are planning regulations here, similar to Paris? One of the things that makes the Paris skyline so wonderful, is the law that limits the height of buildings, so there are no skyscrapers to blot the landscape. We noticed this in Florence too and it seems there are no tall buildings in Rome either. It makes such a difference, to be able to look across the skyline and see virtually the whole city spread out before us, with no concrete towers blocking the view. 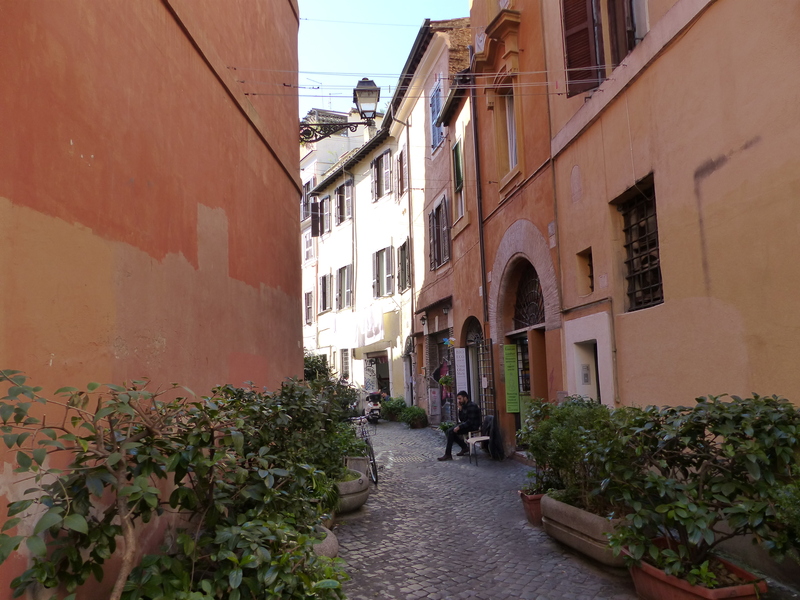 It took us about 90 minutes to walk to the neighbourhood where we would begin our first self-guided walking tour, a tour of the Trastevere neighbourhood, on the western side of the Tiber River. This area was simply lovely, particularly in the outer lanes, away from the main square where most of the tourists were. It was almost like a village within the city, with the small cobbled lanes, the buildings in their colours of yellows, pinks and terracottas, with brown and green shutters and greenery spilling over from the roof top terraces. 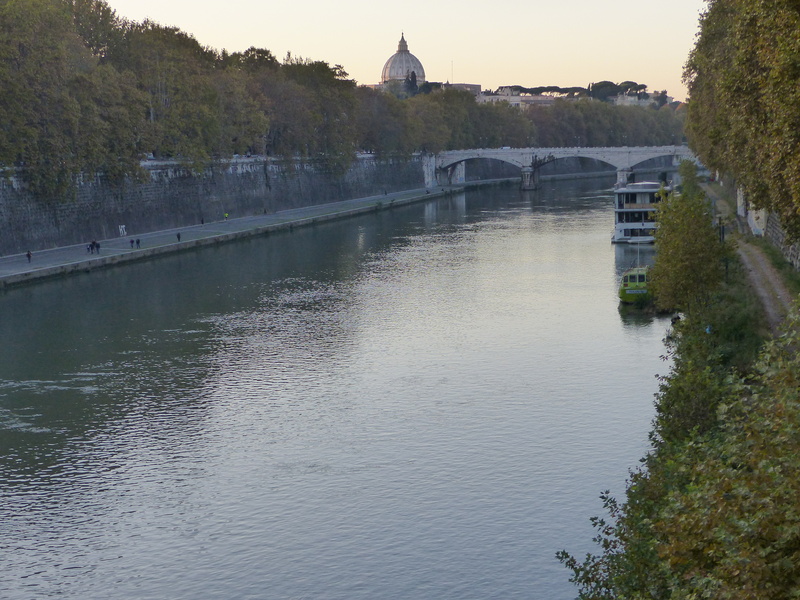 Residents of Trastevere, have traditionally been quite proud of “never setting foot on the other side of the river”! It’s a mixture of bustling streets lined with restaurants and cafes, and quiet lanes, with old, residential apartments, green grocers and small, tucked away trattorias. In medieval times, sheep would have wandered the streets, being herded along the lanes and under the narrow arch ways. The houses don’t have chimneys, so in those times smoke would have billowed from the windows of the houses. Some of the streets are named for the local business that originally traded there, such as Via dei Salumi (Salami Street). 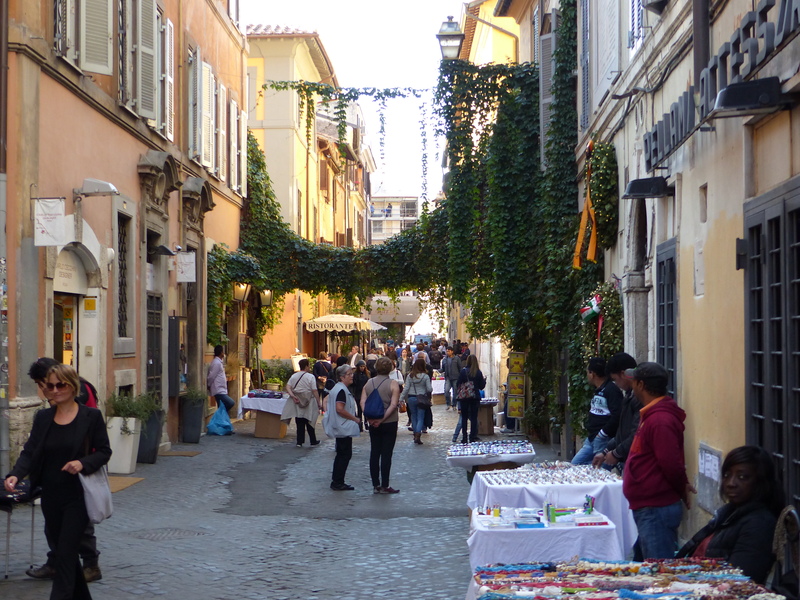 Trastevere was originally a commercial neighbourhood and would have been clogged with a variety of stalls and traders doing business. 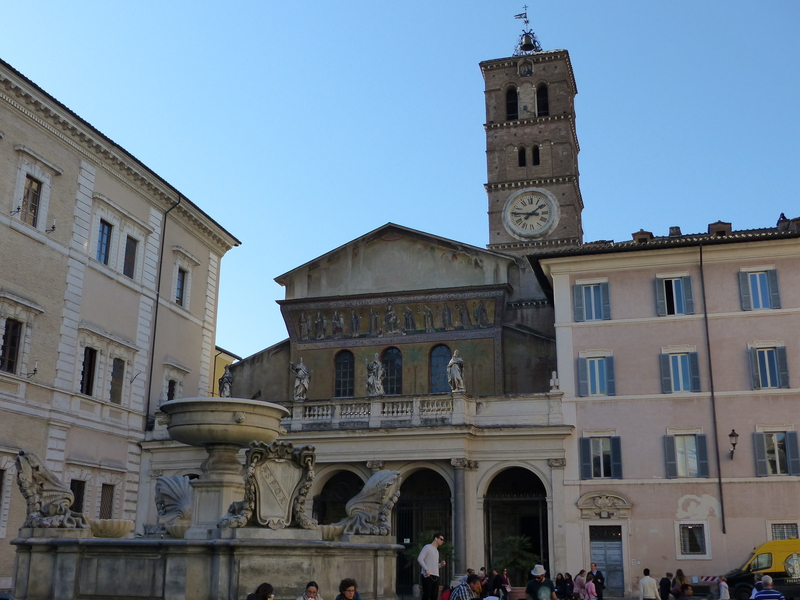 Our roam took us to another grand church, sitting within the Piazza Santa Maria. The Church of Santa Maria in Trastevere was quite a humble looking building on the outside, but that all changed as soon as we stepped inside. 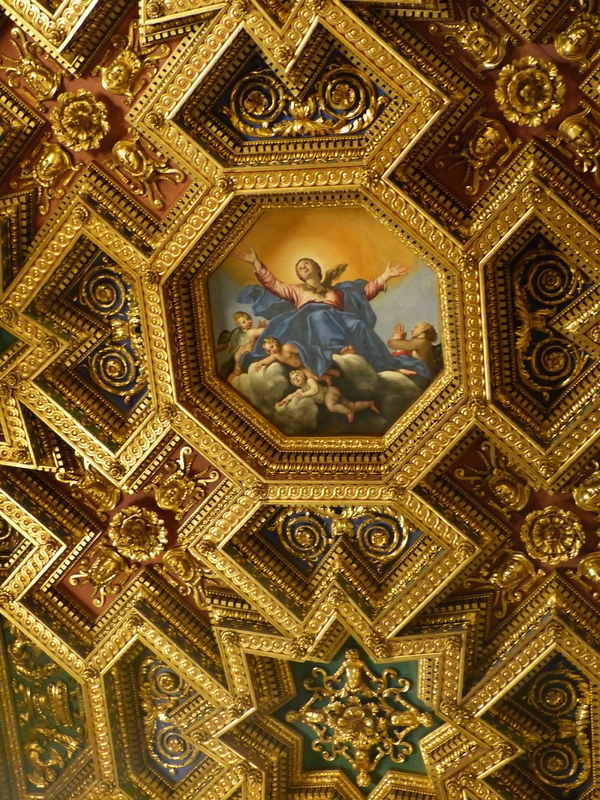 The ornate ceiling, gold mosaics and alter were some of the most opulent we’ve seen. 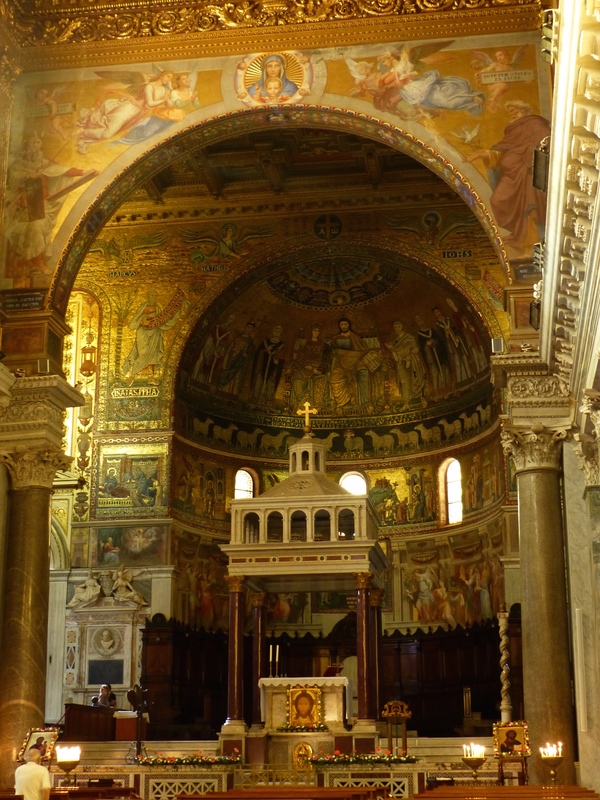 This church is the first church dedicated to the Virgin Mary and is one of Rome’s oldest. We sat and took time to just look up and around at the utter splendour of the interior. I don’t think I’m ever going to understand the church and all its gold, with so many of the faithful living in poverty, so I just looked at it for what it was. The building was quite beautiful, no question. After an enjoyable stroll through this neighbourhood, we sought out a place to have a late lunch and wandered into a trattoria, down a quiet street. This is where I discovered the celebrities I have been with all this time. Steve had finished demolishing a pizza the size of a car tyre and I’d polished off some bruschetta and a salad and we were standing up to leave. The waiter suddenly pointed at Steve’s feet and began speaking rapidly with an astonished look on his face. We began to say we didn’t speak Italian, but then it became quite clear, what his words were, because he held out his hands, with his palms facing inward, in a sign of length. He was amazed at how big Steve’s feet were! He kept talking and then called over another person to take a look at these amazing appendages! He held out his hands again, to show the person he’d called over, to check-out the size of these feet! All the time he’s talking away in a most animated way and pointing at Steve’s feet. Then he called over another person, pointing to Steve’s feet again and holding out his hands to show how huge they were! In the end, he asked Steve how big his shoes were. “46? 47?” he asked, using European shoe sizes. It was the most surprising experience! That waiter couldn’t have been more excited if Steve had walked in carrying an Oscar! For a few minutes there, Steve’s feet were the talk of the restaurant and a couple of celebrities in their own right! Who’d have thought I’d just been walking with such illustrious company! Having had my brush with fame, I joined the pair of celebrities attached to Steve’s legs and we crossed the river to the right bank, to the next neighbourhood we were to explore, the Jewish Ghetto. Rome’s first Jews weren’t persecuted, but were thought of as esteemed envoys, having arrived direct from the Holy Land, to do business in Rome. 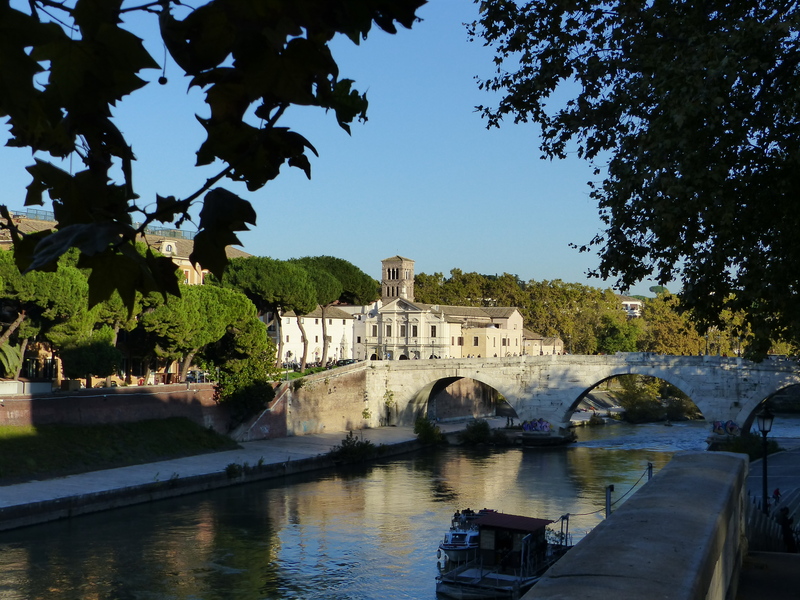 They lived across the river in Trastevere and the bridge that spans the river, was once called “Jews’ Bridge” because the Jewish residents would commute across it. Julius Caesar thought highly of the Roman Jews because they were well networked throughout the Empire and they didn’t push their religion on others. 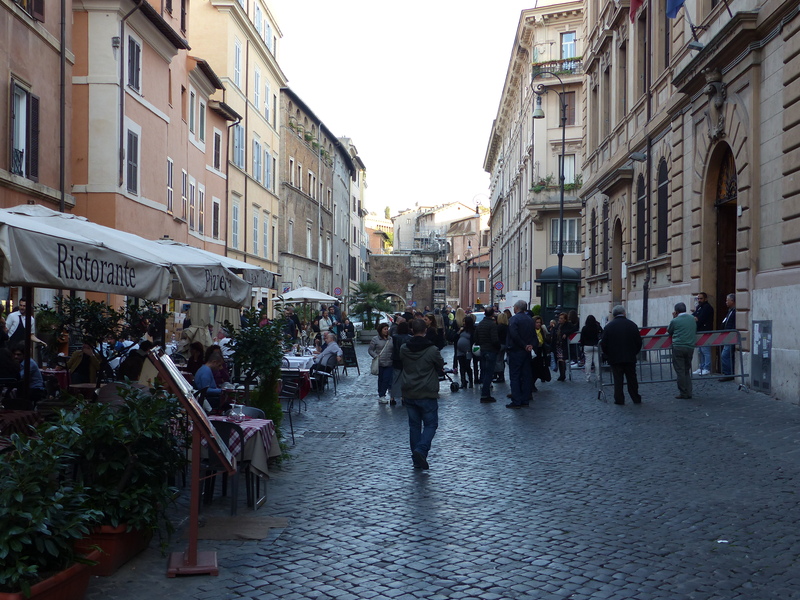 At that time there was a thriving Jewish community of 30,000 people living in and around Trastevere. Things changed though, with the expansion of the Roman Empire and following the Roman invasion of Judea. The POW’s were sold into slavery and after that, Rome’s Jews were viewed with suspicion. 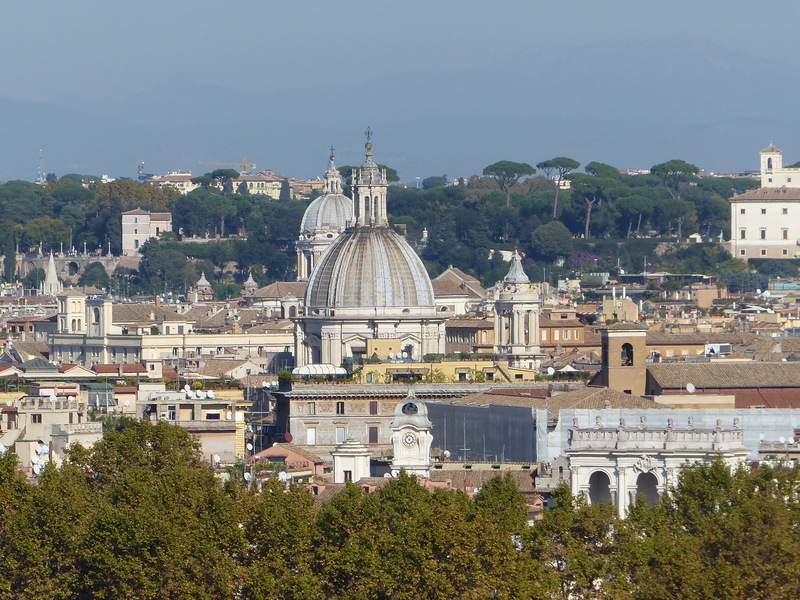 With the spread of Christianity throughout Rome, laws were passed to make it more difficult to practice Judaism. In 1555, Pope Paul IV moved all of Rome’s Jews, by force, into this area on the opposite side of the river from Trastevere, creating a ghetto. At that time, the area was a flood zone and a mucky and awful place to live. Four thousand Jews were forced to live there, behind a wall, with a curfew, for the next three centuries. The Jewish people were forced to wear yellow scarves or caps and were forbidden from owning property. During Carnivale, they were forced to parade down Rome’s main street, while the Christian people lined the street, shouting insults. 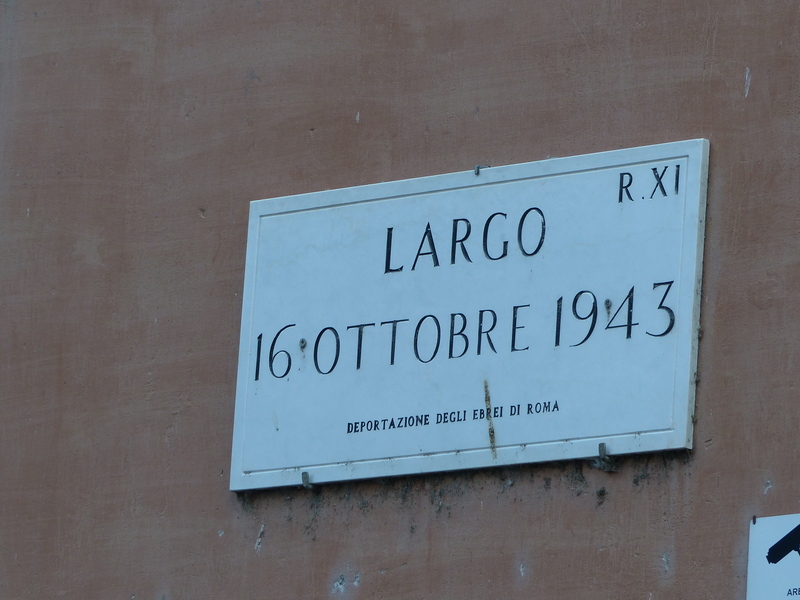 Largo 16 Ottobre 1943 is a square named for the day, where persecution again came to the ghetto. For a while, during Napoleon’s reign, the Jewish people enjoyed more freedom, at which time the discriminatory laws were relaxed and the ghetto walls were torn down. Before the rise of Fascism, the ghetto was destroyed and the neighbourhood was modernised and began to thrive and prosper. This all changed during the rise of Mussolini and the Nazi occupation. On October 16, 1943 the Nazis began rounding people up in this square and deporting them to concentration camps. Today, the area is bustling with Jewish businesses, restaurants and bakeries and is once again, a thriving Jewish neighbourhood. Although, in 1982 the PLO attacked the area and there’s been a police presence there ever since. After a day on our feet, exploring these neighbourhoods, we still did the 90 minute walk back to our apartment, taking the riverside route on our return. It had been another full day on the feet. It was an enjoyable day of roaming, where we saw interesting neighbourhoods and learned some more history. Plus, it was done in sunshine again! Fabulous! I also discovered I am living, walking and cycling in the presence of greatness! 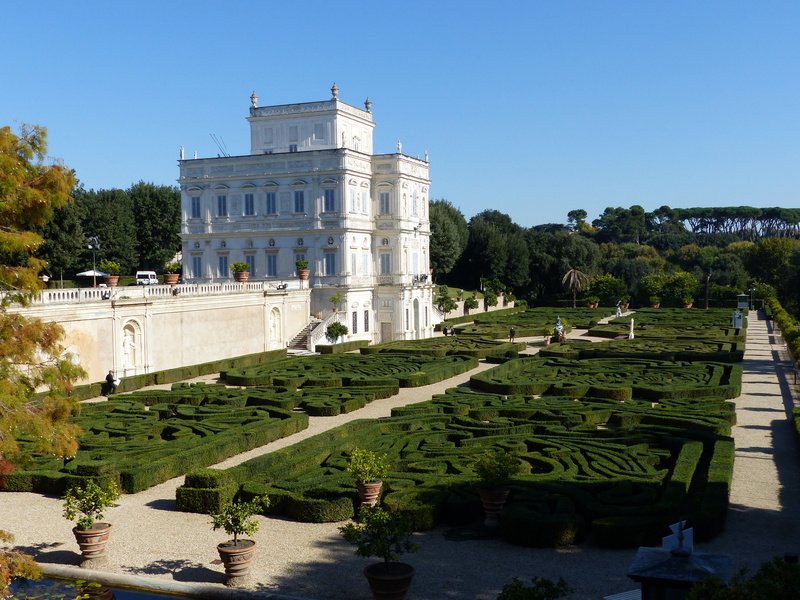 We’ll continue to turn the pages of history as we walk through the fascinating story, that is Rome and its unique history. We’ll roam and learn and discover and question and absorb the fascinating narrative that spills from every corner, street and crevice of this ancient city. I’ll just have to remember to tread carefully and lightly as I follow in the footsteps of the famous, the celebrities, the personalities that can bring a restaurant to a standstill…the great and the glorious…Steve’s feet!